As I reflect back on the past of my involvement with the Cascade Blues Association there have been a great deal of memories. The good friends that I have made and the musicians and friends that have been lost to untimely passings. The events that we have produced and created. And the success that we’ve had with many pursuits. Personally I have been praised with awards, but for me it is more about the accomplishments we have made as a group than accolades for myself. Make no mistake, I am proud to have been honored with three Back What You Believe In awards and a Lifetime Achievement recognition. But as I look at what we have done it is the events like the Willamette Delta Showcase or the Journey To Memphis that I participated in organizing with people like the late Del Seitzinger or Jackson Lee, the Blues In The Schools fundraisers, especially those that had Kenny Neal take part thanks to Jimmy Hale or with my friend Sean Carney, the recordings of the Acoustic Festival organized by LynnAnn Hyde and put together on disc with Ken Condit and Rick Hall, and the twin discs of Puddletown Blues that showcased the blues artists of Oregon that I pieced together with Terry Robb and Dennis Carter in the studio. Even the Show Your Love For The CBA shows that we had to hold to save ourselves from going bankrupt during the hard economic times of late 2008/early 2009.. A situation that we’re once again trying to prevent with our CBA 30 concert. Our local musicians and members have always come through to save the day then and now, and we’re blessed to have them in our corner. I was approached by a friend shortly after the CBA was founded in late 1986 and asked if I would like to join or be involved. While working two jobs at the time it didn’t seem feasible. But I did find the time to join a couple years later and started attending all the monthly meetings and events that I could. The memories started pouring in with the Acoustic Festivals and presentations of touring artists like Earl King, Hubert Sumlin, Floyd Dixon and more. 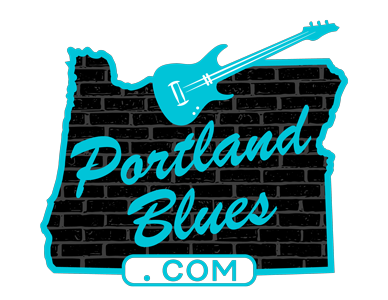 The creation of the Rose City Blues Festival and its morphing into the Waterfront Blues Festival. Eventually I was persuaded by then President Rick Hall and Vice President Val Davis to seek a position on the board after starting to write articles for the BluesNotes the year before. After a couple years as an At Large Board Member, Susan Stewart asked me to run as her Vice President as did Jackson Lee a year later. When I first took on the role as President sixteen-plus years ago, former President Erroll Shervey told me, “Now that you’re in the position, you’ll never be able to leave.” As I look at all these years I wonder if he may have been right. But it has been a labor of love without doubt. 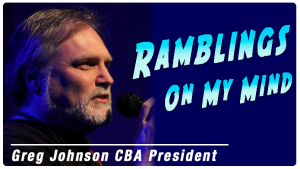 The reason I got into the CBA Board to begin with was to give back to the musicians who had given so much happiness to me over the years with their music. And it is why I still do it today. As I think back there has been a great deal of heartache with the loss of so many friends and musicians. Board members such as the aforementioned Del Seitzinger and Jackson Lee, as well as John Enten and recently David Moore and perhaps my closest friend on the Board R.D. Dill. I still remember sitting in a bar on Beale Street with R.D. having breakfast drinks as I worked out the contract to bring Robert Lockwood Jr. to Portland to play at the Willamette Delta Showcase. Too many musicians that we have all loved left this world way too early, notable Muddy Lifetime Award inductees Paul deLay, Linda Hornbuckle, Janice Scroggins, Jimmy Lloyd Rea and Phil Haxton. And The Mayther Brothers, Fritz Richmond, Rick Welter, just too many overall. Being a member of the CBA Board has offered me many opportunities that I will remember for a lifetime. I traveled to Memphis to represent the organization as we were honored with the Keeping the Blues Alive Award for Organization of the Year in the Congress mandated Year of the Blues in 2003. I have had the honor to meet and become close friends with many artists, both local and international. It also allowed me to introduce some of my heroes on mic from many stages. I will never forget as long as I live such moments with Bobby Bland, Robert Lockwood Jr, Hubert Sumlin and Charlie Musselwhite among them. Again as I reflect on the past thirty years I am reminded of the same statement I have made at the fifteenth, twentieth and twenty-fifth anniversaries. Look back at when the CBA first formed. We had musicians within our region such as Bill Rhoades, Lloyd Jones, DK Stewart, Norman Sylvester, Terry Robb and Curtis Salgado. They’re all still here. They’re all names I mentioned every year along with a few no longer with us. But if you look at the pop acts in Portland at the time you had groups like the late Billy Rancher, Nu Shooz, the Dan Reed Network and Black & Blue to mention a few. All of whom may still work from time to time, but are not on the top of their genre as the blues musicians of town have held onto for the length of time that has moved on. Yes, the CBA is celebrating thirty years. But it is more a celebration of the people who have made the scene long-lasting and thriving for so long, our musicians. The CBA 30 is a celebration for their efforts. We are merely here to make sure to try to see that they receive the praise they so much deserve. Let’s keep those memories rolling on for another thirty years and more. Thank you to all. On another note, I also want to acknowledge the longevity and efforts of our good friend Steve “Squrl” Curley. May marks his twenty-fifth anniversary of bringing the blues to the Columbia River Gorge as both radio host and promoter. Check out his special show this month at The Bingen Theater with the Nick Moss Band. Thank you Squrl for your selfless and lasting work.